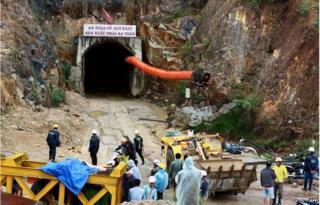 Rescuers in central Vietnam are trying to reach 12 men trapped underground after a section of a tunnel collapsed. The men were working on the Da Dang-Da Chomo hydropower plant in the hilly Lam Dong province when the tunnel caved in early on Tuesday after heavy rain. Authorities have drilled into the rock to pump oxygen to the trapped men, and are clearing rubble. Vietnam is constructing dozens of plants around the country to boost its energy production. Local media reported that a section of the tunnel collapsed about 500m (1,640ft) from the entrance around 07:00 local time (00:00 GMT), crushing tubes supplying oxygen to the workers. Officials said about 200 rescuers are pumping in oxygen into the tunnel, strengthening the roof to prevent further collapse, and clearing away sand, earth and stone. But officials have said continuing rain and heavy winds are hampering rescue efforts, as well as the narrowness of the tunnel and the rising water level. Nga Pham of BBC Vietnamese says the workers are reportedly in good health, but have to sit on wooden planks as water levels rise in the tunnel. Rescuers can now talk to them via tubes. Our correspondent says that safety protocols are often not observed at worksites in Vietnam, and the quality of construction materials can also be questionable. Vietnam draws more than one-third of its electricity from hydropower. The Da Dang-Da Chomo hydropower plant is expected to produce about 110m kWh annually. It cost about 475bn dong (£14.1mn, $22.2m).